Clean, peel and dice the onion. Place in a large covered glass or ceramic baking dish. Add the basil, oregano, and hot sauce. Mix together, cover and cook until the onions become semi-translucent. 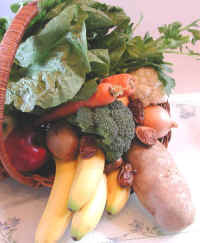 Wash and clean the potatoes and remove the eyes (the skins may be left on, if desired), and cut into 1/2 inch (1-2 cm.) cubes. Add to the baking dish. 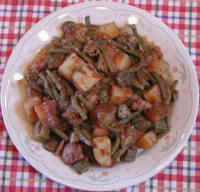 If you are using fresh green beans and/or okra, wash, clean and cut the green beans and okra as desired and place in the baking dish with the pre-cooked onions and the potatoes. 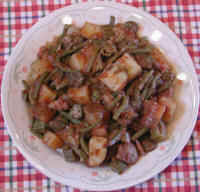 If you are using frozen green beans and/or okra hold them until after the potatoes have been partially cooked. Cover the baking dish and place in the microwave or conventional oven, and cook until until the potatoes, just begin to become tender (mix occasionally to make sure the veggies are cooking uniformly). If you are using frozen green beans and/or okra, add them now on top of the other ingredients, cover the baking dish, and cook until the beans have defrosted and become warm. Add the crushed tomatoes, and tomato paste, and mix well. 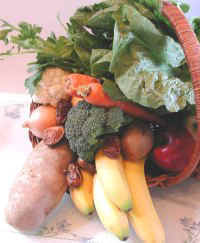 Cover and cook until the potatoes and other veggies become softened so that a fork will easily slip into them. Mix every 5-10 minutes to ensure even cooking.